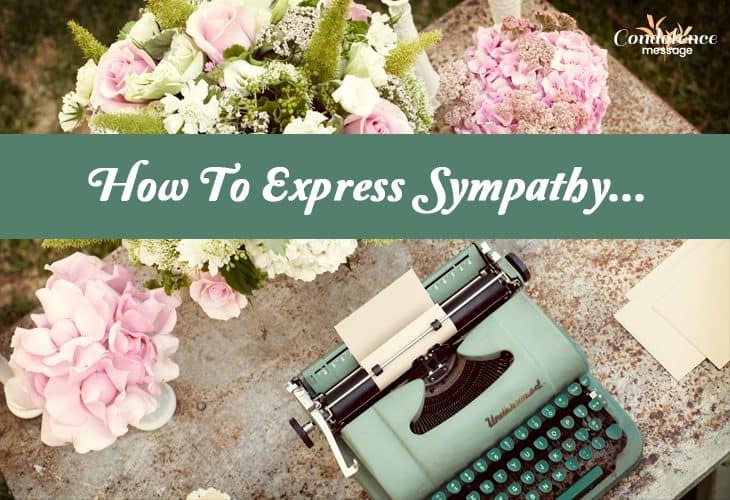 You can convey the simple and short condolence messages to the demised with respect and affection rather than expressing your sympathy broadly. The survivors already mourn in the moment of grief and they probably have the least interest and time to read or hear the extended lines of condolence. You should make the messages succinct but it should be heartfelt and consoling. Just remember, your kind and polite words can act as honest support in the catastrophic period. We are earnestly sorry for your prodigious loss. My sincere respect, love and earnest condolences to your dad. Whether I am far or near to you, my love and prayer are always with you. May the soul of our Jenny aunty rest in the arms of the Lord in Heaven. Amen! I am deeply sorry for the death of your uncle and want to pray for your peace and forbearance. The departure of your sister has devastated your family and I am really hurt. The sorrowful news of your mom’s demise is shocking, it’s unbearable for me. I am one phone call away from you, just call me whenever you need. Sorrow engulfed all our happiness when we learned about the demise of our dear friend. Your late granny will be heartily missed by me and my family. May God endures your power and delivers peace to the spirit. Amen! May the fond memories of your brother act as a cool breeze to our burning hearts. Sorry, I still cannot believe that your wife is no more and we are attending her crematorium. May the soul of Robert uncle rest in peace. RIP. Sincere condolences to the departed soul of your loving nephew. Our kind Lord is there to show light in the dark phase, so please be calm dear. Don’t worry friend, the shade of God is for the oppressed and deprived people who lost loved ones. He is gone from our eyesight, but still will be in our heart with serene memories. Fondest reminiscence and love to the kind soul of aunt Lily with hearty condolences. I apologize to say anything at the pathetic situation is confronted by you and your family. Sorry cannot make alive a dead person, but I have nothing to say at this moment. Death always leaves a heartache that no one can heal, earnestly sorry. My tears are the silent language of my grief. I am hurt to see you sinking under the pain of losing your sister. I know sorrow can be alleviated, but the death of loved ones cannot be eased by the remedy. Her physical mortality cannot remove the immortality she left with her noble works; I will miss her. You are unable to share your pain with me, but my presence will befriend your gloomy period. Sherry will be a never-ending tune in my heart forever after her death. Graciously, your little daughter tiptoed in your world and left an imprint of footsteps after her demise; truly sorry. Your little sister is an angel at the house of our Heavenly Godfather now, so be calm. Really pathetic, the root of the family tree is shaking after the death of your grandfather. You are crowned with the burden of sorrow and agony, but I will pray for your respite. Death is the beginning of new life dear, so, do not lament buddy. Her body is buried but the soul is always with us my friend. We bid farewell to the noble soul of our principal sir. Andrew sir was my role model and his guiding hand on my shoulder will be forever. Mortality has engulfed our kind aunty and shattered everyone. Your husband was the lines of your poetry and his demise has broken the lines. Heartily condolences and love to your father-in-law, he was an inspiration to everyone. The sunshine in the smile and magic in the touch of your mom will always surround you. I won’t say you to weep away your tears, but please sob on my shoulder. Your wound cannot be healed by sympathy words, prayers can only reduce the pain. I know the laughter of your younger sister was a source of joy, the giggling sound still resonates in my ear. Just want to say, I am deeply regretting the loss of your wife. Your beloved is deceased, but she is present in the sea-foam, cold breeze and wings of flowers buddy. Tide recedes but leaves the seashells behind, death snatches but leaves the memories behind, miss you. Sorry, the cacophony of death has devastated the music of life after the demise of your father. The harmony will be provided by the Almighty to the noble soul of your granny. Amen! May the sweet fragrance of the burning candle and white flowers deliver solace to the departed soul. I wish God provide you courage to hold the hand of your children after the demise of your husband. The shining sun, moon and stars will always be with you in the form of blessing of your mom. Happiness has deceased, and the sadness which has surrounded your life after the demise of your dad, really pathetic. Today and always the sweet memories of your kitty will bring solace and comfort in your heart. Our love and well-wishes are always with you in the dark period of your life. Hard to imagine the pathetic condition of your life after losing your newborn baby. Please allow me to help you in this hard situation. I cannot offer anything except tears, flowers, tribute and condolences to my departed pup. I am sure, the kind Lord will help you to stand strong after the death of your beloved. Your mom sacrificed and struggled in different phases of life and now she will rest ceaselessly in Heaven. Truly sorry for your loss, please don’t cry my sweet friend. This is remorseful for us to convey condolences for the demise of your brother. We just heard your aunt’s passing, and deeply hurt by the news. I will never forget your mother’s generosity and supportive nature ever in life. Unfathomable condolence from my entire dance troupe to Emily ma’am. With wholehearted prayers and much love, we bid goodbye to Jack. Death engulfs a happy life without any notice, really sorrowful for your sisters passing. Bereavement never knocks the door before entering, and the death of your son is the proof; I will miss him. Hope you will recall me whenever required, I will be glad to be with you. Let’s cherish the memory of Kate aunty and pray for her spirit. Reading the Holy Bible will endure power to your soul and make you strong. I plead from the kind Heavenly Father to guide the soul of your lovely daughter. My heart goes out to your mother with the unexpected demise of your father. Memories of our sir will always be treasured in our hearts. Words fall short when I try to express my concern to your family in this miserable condition. The heartwarming memoirs of our cricket coach are engrossed in our soul after his demise. She may be in Heaven and you are at earth, but your love will be perpetual after her departure. Remember, death cannot separate the everlasting relation between a mother and a child. I know your pain is oozing from the wound in your heart, but God’s power will wash and heal it. I can see your helpless condition by the death of your father, but don’t know what to say. Tears in your eyes are dews of compassion, our Lord can see your suffering and he will help you. Winter is the end of a year and death is the end of life, so it is an inevitable truth dear. My mute appeal of sympathy may not act as a remedy to the heartache, but my hand is holding you. Farewell, my dear friend with lots of love and prayers. Don’t suppress your grief and tears, let is wash your pain away with an outburst. Share what you want to say, I will hear your agonized voice. Your grandfather is not between us, but his noble deeds will keep the kind soul immortal. May our sincere concern and condolences bring warmth to your heart. Our dad taught us the way to live in life but we don’t know how to live without him. Let the grateful memories of your deceased brother help you to survive in the time of sorrow. Memory becomes a treasure when someone you loved becomes a reminiscence. The music collection of your daughter will forever remind you that her soul has not died. The blessing and love of the pious soul of your grandmother are always with you. God is always close to the broken-hearted people who lost their loved ones. Your tears will turn into sacred dew drops and our kind Lord will heal your wounds. The Almighty will relieve the discomfort of your weary heart which is burdened after the death of your dad. I wish I could have taken distress from your life, but no one can discharge the grief of a son. The death of your son is a blasphemy to your life which is hard to accept. The drops of rain in the crematorium ceremony is the blessing shower of your dad. May time fade the grief of your lost brother. I will tenderly hold you with a warm hug, my sweet sister, please stop crying. His memories are naturally bringing tears in my eyes with a recall that he is no more. Our neighbor stayed for a few days but her footprints are left on my heart after her demise. No goodbyes for our uncle, his soul is still among us. Remember, I will never forsake you in the dusky moments of life. May the ascended spirit get a proper guide from God and guardian angels in Heaven. I believe the divine power of Heavenly Father will make you strong in this gloomy period. Although it’s difficult to bear the loss of a sister, still I wish for your restraint power. Death cannot kill the noble works of pure soul, we will really miss you, ma’am. May the guiding light of the pious soul of aunt Raina supervise us in every perplex moment. Ocean of gloominess is drowning you, God can only be the saviour now. Our friend was the pillar on the porch, he was always there with us and it’s the time to pray for him. The traumatic situation is pathetic, just want to pray for the peace of the departed soul. Sorry, the outpouring of my sorrow has no words to reveal for the departed person. It’s my earnest request to you please hold yourself for the family at this moment. Accept the heartfelt concern and condolence with lots of affection. I pray the kind God enfolds your mom in the journey of misery for your dad’s death. Terribly sorry to hear about the passing of your father-in-law. Much conversation is useless in the moment of loss, I will pray for the soul of your niece. Conveying honest respect and condolences to your dad. Hope our dear Lord will bestow his mercy on you and help you to hold your tears. Respect the values and faiths of the bereft while consoling. Keep the message short with consoling gesture. Show your worry in an unpretentious way. Feel sorrowful and sorry while saying anything. Provide support to the distressed individual in a politely. Make the message short but it should not show your careless attitude and disregard. The closing line of the condolence message should be short, but not be confusing. 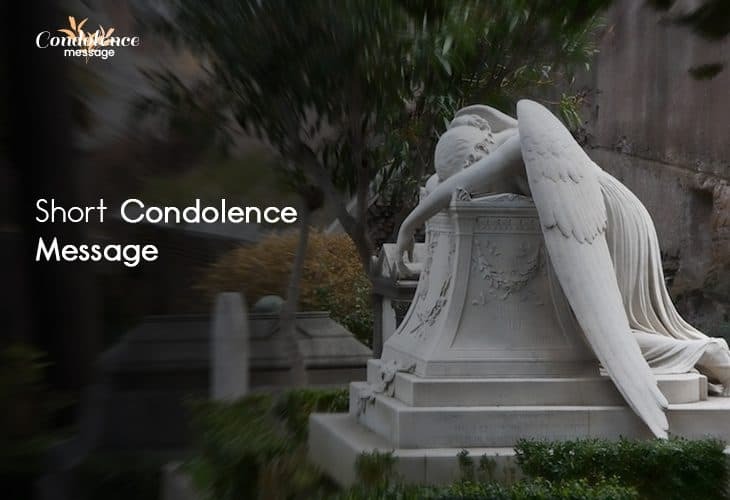 The modest and short condolence messages should be presented in a soothing way to show your concern to a mourning person in a brief process since the long words may be annoying to hear during the tragic moment. These humble messages can reassure your presence with the grief-stricken in the despondent time when he is shocked with the traumatic incident.